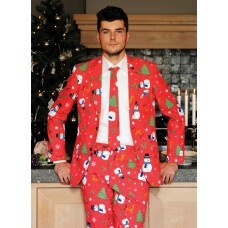 Christmaster Christmas mens suit & tie. If you think Christmas, you're probably thinking Christmas trees, snow, holly, reindeer and the colour red, right?! Well, we do anyway. And due to the simple fact that us tailors already produce suits anyway, we crammed all these Xmas elements together into the most Christmassy Christmas suit you will ever find. You can now dominate your Christmas* party by turning up in this ultimate Christmas fancy dress attire and easily outdo all of your mates who are likely to be wearing a cheesy Christmas jumper. 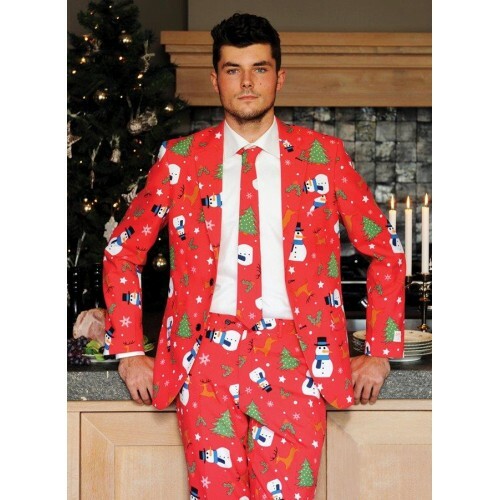 Oh, and if you like your current job and you're planning to wear this suit to the Christmas party at work, don't complain to us when your boss promotes you! Do you have the Christmas balls to wear Christmaster?